Comments: One of my favorite CD's and favorite bands! Had this CD playing a lot the past couple weeks wrapped around the 17th. Great mix of some Irish favorites. Write about With All Due Respect - The Irish Sessions! 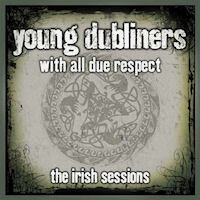 Want to write a review about Young Dubliners's With All Due Respect - The Irish Sessions album? Post your comments in this box to be displayed in our community forums and in our album database! Please make sure you are logged in before proceeding. Please login to write your comments about With All Due Respect - The Irish Sessions.